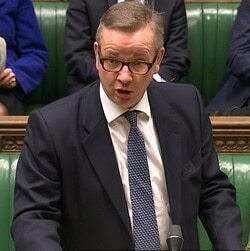 More serious criminal defence work should be restricted to barristers, and solicitor-advocates who want to do it should have to requalify, the former Lord Chancellor, Michael Gove, has suggested. He also called for a “higher-quality filter” for those wanting to become barristers and reiterated his support for a levy on City law firms to aid those less fortunate. Mr Gove was giving the Longford Lecture, which he said he was invited to do during his time in office and was a commitment he wanted to honour given that it was named after the famed penal reformer. He offered a wide-ranging critique of the problems in criminal justice, and listed a series of reforms which he said were vital to improve it. One of them was reviving the criminal Bar. He said: “Always the poor relation of the rest of the Bar, criminal work is now in increasing danger through the slow strangulation of the supply of talent it needs to prosper. “Any gifted graduate now contemplating a career in the law will be aware that huge fees accrue to those who are successful in the commercial Bar and salaries of hundreds of thousands of pounds a year are the norm for partners in top City law firms. He listed several factors have “conspired to undermine the position of the criminal Bar”, even though they were “well intentioned at the time”. Extending rights of audience to solicitors “should have brought welcome competition which drove up standards and opened the profession of advocacy to new talent”. Equally, broadening the number of individuals who could read for the Bar, and increasing the number of training institutions, “should also have, through competition, raised standards and improved access for individuals hitherto excluded from the profession”. He explained: “More and more individuals have sought to qualify for the Bar, at the same time as crime has been falling. And while there has been a growing number of people who wish to act as advocates, the barristers’ chambers who act as a quality filter cannot accommodate these numbers. While there were “some very fine solicitor-advocates”, the MP referred to the findings of the Jeffrey review and said there was “no doubt that, individual for individual, barristers provide a better service”. Solicitor-advocates handled 43% of criminal defence work in 2014/5, compared to 6% in 2005/6. “This represents not just a shrinkage in the amount of work undertaken by the professionals best qualified to defend those whose reputations and liberty are at stake, it also indicates that access to the best representation is increasingly restricted to the wealthy. Mr Gove said there was a case for saying that defendant in all Crown Court cases and the more serious magistrates court cases should be represented by a barrister. “High quality existing solicitor-advocates could, of course, become barristers in appropriate circumstances. I also think there is a case for a higher-quality filter being applied before people can read for the Bar in the first place and would like to see the Inns of Court play a significant part in establishing a higher quality threshold. Mr Gove also mentioned the “responsibility of the very wealthiest in the legal profession to do more to support the rule of law and access to justice, which we could deliver through a levy on the incomes of the most successful”. The Ministry of Justice is still to publish its response to the consultation entitled Preserving and enhancing the quality of criminal advocacy, which closed just under a year ago. Shortly after the consultation was published, Legal Futures satirised Mr Gove’s apparent love-in with the Bar here. Interesting and good points. Complete lack of understanding of practice and how the system has worked and developed to the stage we have reached now. So simple when you understand nothing and live in utopia.